Easy to read degree indicator with auto stop standard! Ratcheting counter die adjustment for quick tooling changes! The RDB-175 hydraulic pipe bender is a powerful machine capable of bending 2" Schedule 40 pipe and up to 2-1/2" tubing with a wall thickness of .120" mild steel. 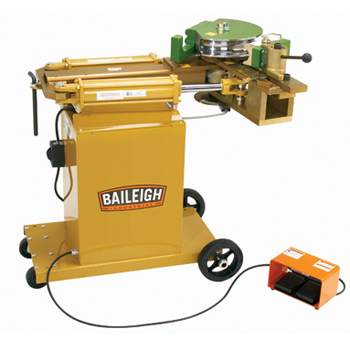 This style of bender (RDB-150) was introduced to the market by Baileigh Industrial in 2002 and now has thousands in the field working flawlessly every day. The RDB-175 tubing bender is capable of a 9" center line radius, and can easily bend 2 times the outside diameter depending on the wall thickness of the material. This rotary draw bender is a high speed version that returns at almost 300% of the bend rate, that increases production dramatically. This is a hands free model that is foot pedal controlled, great for serpentine bends like bike racks. Programming is true since that the die head is measured instead of cylinder placement which doesn't give you true placement of the angle like other machines on the market do. We have increased the CLR to 9" that will take care of 90% of most applications. The RDB-175 hydraulic tube bender has a fast and accurate ratcheting counter die positioner allowing for acute adjustments for the most finicky materials.